First: the French Open. Next stop: your wardrobes. Serena Williams is a verified tennis champion. Now, she's bringing her talent—and style perspective—to the masses with the Serena collection, an Ivy Park-meets-Reformation range featuring everything from a gold slip dress to weekend joggers. 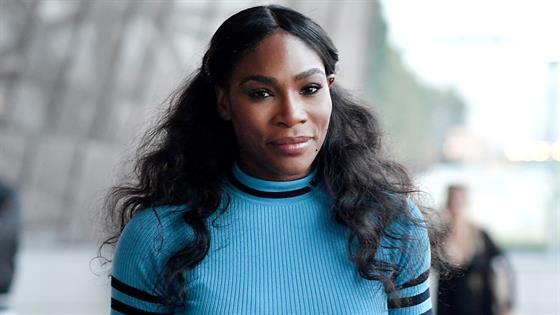 "I've been inspired by powerful women and I've been inspired by words," the tennis pro told E! News. "Like a simple word like ‘strong' just gave me a lot of inspiration." This basic influence is realized in a gold chain-link strap that accents a denim dress. "That detail to me was a really strong, bold detail," Serena added. "And things like that [are] really what the collection is all about." Although the athlete's career and lifestyle has been a major influence, just don't expect athleisure. "I always want to be comfortable. I always want things to be functional. Because that's my life," said the tennis star. "But, also, [I'm] bringing high-end fabrics to that." The fashion designer also wanted to create empowering pieces. You'll find fabrics that stretch for curvier body shapes and pants with "I am beautiful" written on them. Thought has been clearly put into the collection. Before you think Serena has just lent her name out to the brand, she's has the skillset to back up it up, too. "I also went to fashion school when I was younger. My major was actually fashion, so learning how to pattern-make, learning how to sew—I literally know how to do everything when it comes to making a garment," she shared. Adding to her style cred, the athlete has also had numerous collaborations with Nike and collections on HSN. This latest venture, however, is completely her own. "I've never had one on my own—a Serena collection, a luxe collection," Serena noted. "That's kind of what I wanted to do. I wanted to believe in myself. I wanted to invest in myself." The collection is available now exclusively on SerenaWilliams.com.